Dustin Poirier is no stranger to Fight of the Year caliber bouts. The lightweight contender’s grueling matchup with Chan Sung Jung was MMA Fighting’s 2012 Fight of the Year. Justin Gaethje? Well, let’s just say that 100 years down the road, it wouldn’t be a surprise if Fight of the Year is known as The Justin Gaethje Memorial Fight of the Year. Not only was Gaethje’s victory over Michael Johnson in July 2017 named MMA Fighting’s 2017 Fight of the Year, but his UFC 217 loss to Eddie Alvarez placed third. So is it the slightest surprise that when you put Poirier and Gaethje together in the same cage, a Fight of the Year is likely to break out? That’s what was anticipated when the main event of UFC on FOX 29 was announced at Gila River Arena in Gaethje’s backyard of Glendale, Ariz. — and that’s exactly what was delivered. Is it the slightest surprise that when you put Poirier and Gaethje together in the same cage, a Fight of the Year is likely to break out? That’s what was anticipated — and that’s exactly what was delivered. The duo threw down with reckless abandon for three rounds before Poirier dug deep and finished things in the fourth. This time, Poirier — who lost his award-winning 2012 bout with “The Korean Zombie” — was the one who had his hand raised at the end, earning a TKO victory at the 33-second mark. Gaethje fought the only way he knows, throwing vicious leg kicks and wading forward through punishment. Poirier was all too willing to oblige with violent counters. The kicks caused Poirier to switch stances early, but he delivered more than enough damage of his own with sharp combos to the head and body. Gaethje twice eye-poked Poirier, the second of which led to a point deduction. The hometown hero appeared to be turning the fight in his favor in the third round, but Poirier came out like a bat out of hell in the fourth and unleashed an onslaught until referee Herb Dean waved things off. From there, Poirier went on to win another exciting bout at UFC on FOX 30 with a second-round TKO of Eddie Alvarez, and he now waits in limbo as the promotion figures out which direction to take lightweight champion Khabib Nurmagomedov next. As for Gaethje? 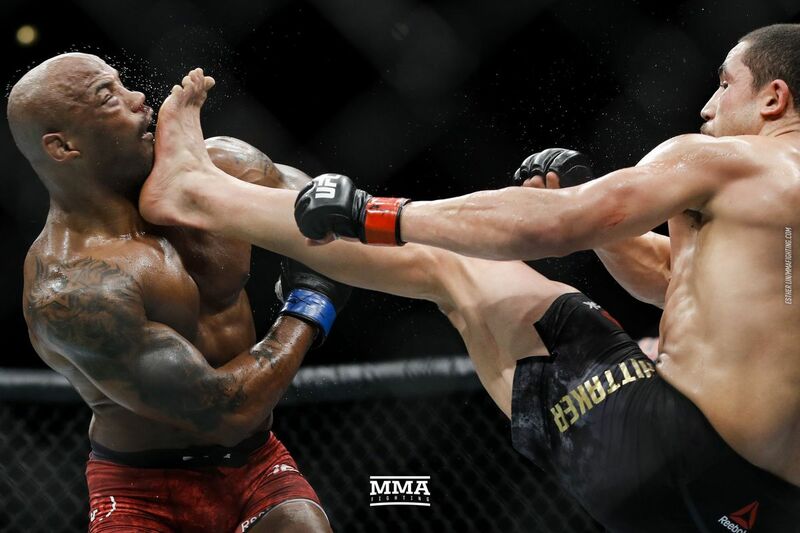 There were loud whispers that maybe his fight style was finally catching up to him, but returned four months later and delivered a memorable first-round knockout of James Vick in the main event of UFC Lincoln. Poirier vs. Gaethje was named on all but one ballot by MMA Fighting staff, including seven first-place votes (the most by any candidate) and three seconds among its 120-point total. The UFC could scarcely have picked a better matchup to represent the evolution of mixed martial arts for its 25th anniversary show than the featherweight headliner of Yair Rodriguez vs. Chan Sung Jung on Nov. 10. The company returned to Denver — the site of UFC 1 on Nov. 12, 1993 — with a main event featuring fighters from opposite ends of the globe, matching “The Korean Zombie,” whose heart in the heat of battle is immeasurable, against Rodriguez, the Mexican sensation with next-generation striking skills. For nearly 25 minutes, the duo put on a display worthy of the landmark event, as the two featherweights fought tooth-and-nail in Denver’s suffocating elevation, neither giving an inch in a bout that appeared headed to a coin flip of a decision. In a finishing sequence for the ages, Jung took one last charge at Rodriguez. Rodriguez ducked. Then, Jung was face-first on the mat. Many assumed there was an accidental headbutt. Only on the replay did it become clear that Rodriguez somehow caught Jung flush on the jaw with a ridiculous counter elbow, causing a knockout at 4:59 of the fifth round. Rodriguez vs. Jung was the easy choice for MMA Fighting’s Knockout of the Year. It might have been the greatest finish in UFC history. 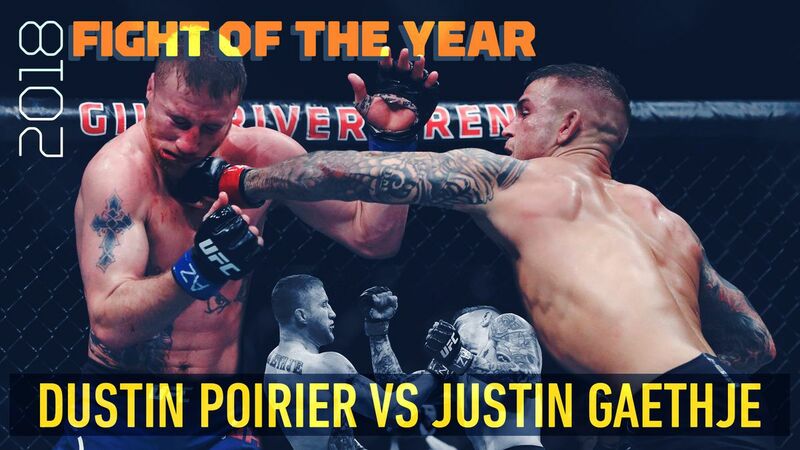 And if not for a battle as outstanding as Poirier vs. Gaethje, it may have taken top Fight of the Year honors as well. As is, it earned six first-place votes, five seconds, and took 113 points overall to the winner’s 120. The first fight between Whittaker at Romero for the interim middleweight belt at UFC 213 was a memorable encounter, as Whittaker dropped the first two rounds then rallied to take the last three. Fast forward just under a year and the second encounter somehow managed to top the first. This time, Whittaker was elevated to the full championship. Romero, for his part, missed championship weight by 0.2 pounds, meaning he was ineligible to win the title with a victory. But he sure was eligible to put on a hell of a scrap. The rematch saw the script flip, as Whittaker was the one who got off to a fast start. Romero’s troubles were compounded by a glancing blow which caused his right eye to swell nearly shut. 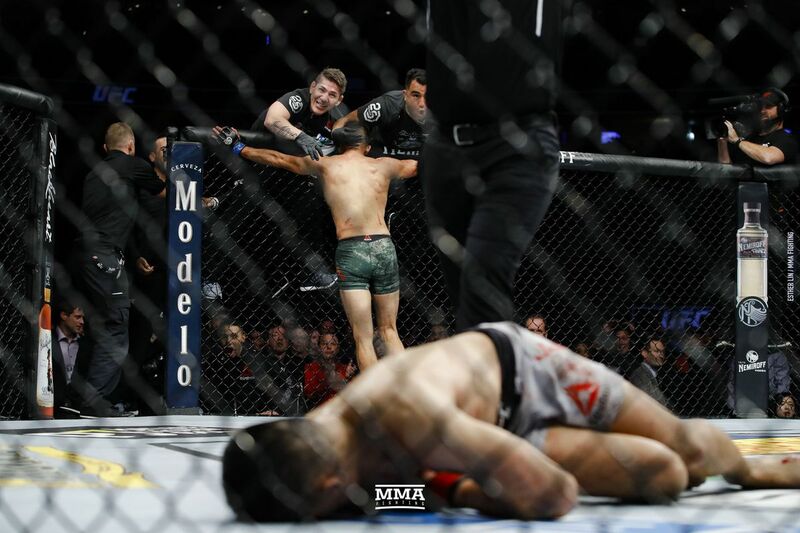 But the duo engaged in an insane, back-and-forth third round, and in the fifth, Romero went all-out, dropping Whittaker, who barely hung on until the final horn. In the end, Whittaker’s early work won the day, as he got the better end of two out of three 48-47 scorecards for a split decision. The two middleweight also garnered the final two first-place votes from the 15-member MMA Fighting voting committee, en route to collecting 93 points and third-place overall finish. As the co-feature fight on the year’s biggest stage before Khabib Nurmagomedov and Conor McGregor squared off, Tony Ferguson needed to remind the world that he still belonged next in line for the UFC lightweight championship. The UFC might have made his interim belt disappear, but they couldn’t take away his 10-fight win streak. 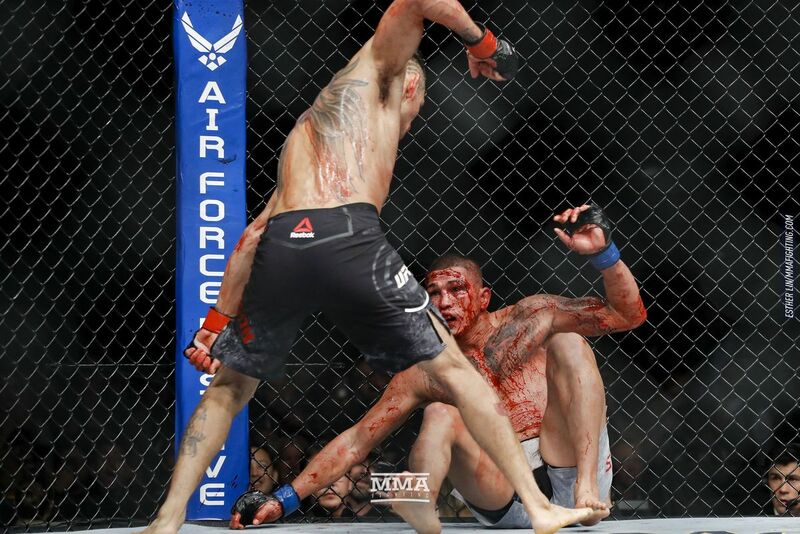 As for Anthony Pettis, this was his chance to show the world that the former UFC and WEC lightweight champion still had some of that “Showtime” magic left. It was a wild 10 minutes of blood, sweat, and violence. Ferguson got the better of things, sure, but Pettis did more than enough to hold up his end of the bargain in a tornado of offense which started out fun in the first round and then hit the accelerator in the second. Pettis, unfortunately, broke his right hand in the second, and Ferguson started pouring it on. If not for the injury, the bout may have ended up with a sensational third round and topped this list. Instead, Pettis’ corner smartly waved things off for a Ferguson TKO at 5:00 of round two. It was UFC 229’s Fight of the Night and fourth place on our Fight of the Year list. Who doesn’t love a wild brawl? 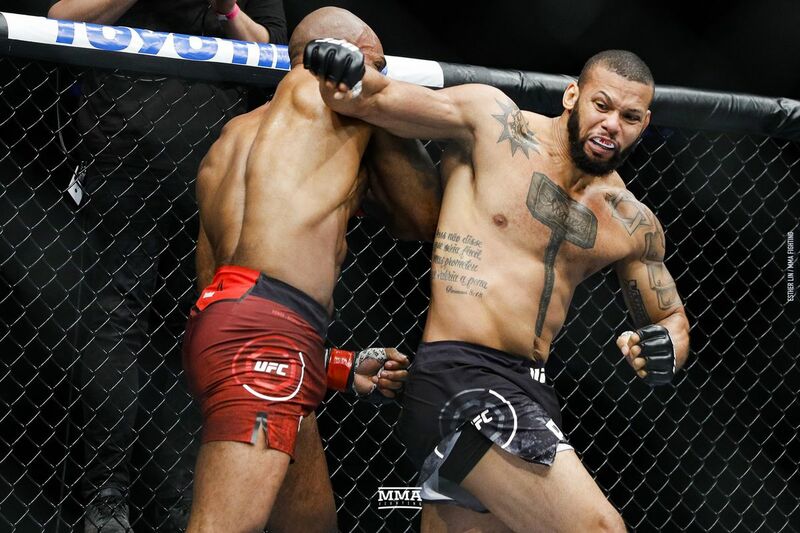 Thiago Santos and Jimi Manuwa are both finishers, and they came out looking to make a short night of things at Toronto’s Scotiabank Arena. Santos, who made the successful jump up to light heavyweight from middleweight, dropped Manuwa twice in the opening seconds. Manuwa cleared the cobwebs, and an “everything but the kitchen sink” first round was on. While neither competitor got the kill shot in the opening frame, Santos went for broke again in the second — and this time it paid off. An absolutely nasty roundhouse right to the temple dropped Santos and ended the fight at 0:42. Perhaps there’s a bit of recency bias with this under-six-minute scrap cracking the top five — another sub-two-rounder of considerably higher skill, Poirier vs. Eddie Alvarez in July, somehow didn’t get a single vote from the panel — but there’s no doubting this matchup was the year’s most memorable sugar high of a fight. Here is how the voting for MMA Fighting’s 2018 Fight of the Year played out.